The ROS-Industrial Consortium Americas (RICA) held its 2018 Annual Meeting in San Antonio, on the campus of Southwest Research Institute (SwRI) on March 7th and 8th, 2018. This was a two-day event, with the 7th open to the public, including tours and demonstrations, followed by Consortium Members meeting on the 8th with a road-mapping exercise and project idea brainstorming. This was the first time that RICA held the event over two full days. Also, this was the most well attended event, topping out over 80 people on the 7th. There were talks spanning from the more strategic/visionary to the technical with regards to open-source robotics application development. This provides an excellent cross-section of the technical development community and organization decision makers to share ideas and cross-pollinate taking back what they learned to their organizations. The talks touched on a mix of how humans can interact with the technological solutions and also the need for solutions that can work within environments originally designed for people. The common thread is enabling humans and robots to work more efficiently within the same spaces, and leveraging the same tools. Rick Meyers of the ARM Institute & Air Force Research Laboratory, during the lunchtime keynote, discussed the vision and motivations of Air Force ManTech to drive advancements in automation and robotics in the manufacturing environment. This tied into the motivation of the Advanced Automation for Agile Aerospace Applications (A5) program, and how ROS ties into the realization of the Air Force ManTech vision. The tours and demonstrations included many different applications, all with either ROS/ROS-Industrial element, though in some cases complimentary. ADLINK Neuron focused on coordinated mobile robots and a means to assist their industrial partners to easily transition to the ROS2 environment and provide consulting services for DDS implementation and ROS-related algorithm development. KEBA demonstrated their new ROS RMI interface integrated into their controller, while UTARI demonstrated Manufacturing in Mixed Reality implemented through the Microsoft HoloLens, allowing users to fuse process guidelines, real-time inspection data, and cross reference information to determine adaptive measures and project outcomes. SwRI and the ROS-I team demonstrated an example of merging SwRI’s Human Performance Initiative’s Markerless Motion Capture combined with path planning to retrieve an object from an open grasp. SwRI’s Applied Sensing Department showcased their Class 8 truck enabling all attendees to go for a ride, while gaining insights to the vehicle’s capabilities. 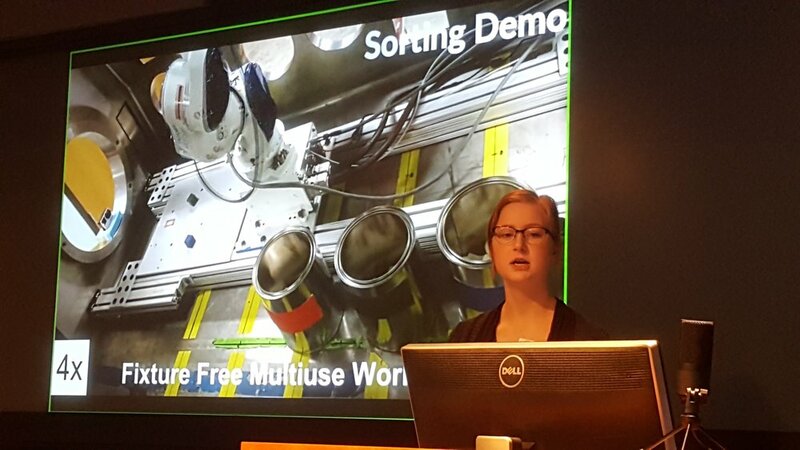 The ROS-I team at SwRI also presented Robotic Blending Milestone 4, Intelligent Part Reconstruction, with TSDF implementation, and Trajopt, a newly fully-integrated into ROS sequential convex optimizer. The UT Austin Nuclear Robotics Group demonstrated their improved situational awareness for mobile manipulation on their Husky platform where users could “drive” the system to pick up a presented object. Finally, the SwRI team presented and demonstrated the A5 platform, which is a mobile manipulation platform designed to perform numerous processes on large aircraft in an unstructured setting. The process demonstrated was sanding of a test panel overhead. Overviews of the localization and planning on the visualization were included. This set of talks brought home innovations by the OEM and service provider communities. Bastian Solutions’ story of concept via working with the ROS-Industrial team, through pilot and into production, demonstrated a real value proposition for mobile solution, and broader ROS-enabled, development for the integrator community. Matt Robinson covered strategic initiatives for the Consortium followed by Levi Armstrong covering RICA technical developments, including TrajOpt and Intelligent Part Reconstruction, Noether, PCL Afront Mesher, and Qt Creator updates and upcoming release. Mirko Bordignon highlighted for the Americas audience what is happening around the ROSIN initiative, driving awareness, and furthering the global nature of ROS-I. Min Ling Chan shared progress within the Asia-Pacific region and the progress and status of the Pack ML Focused Technical Project, which has a Phase 2 launch coming soon. Dirk Thomas of Open Robotics presented the latest on ROS2, and for the first time we were happy to welcome Bob Grabowski of the ARM Institute. The ARM Institute is the newest DoD Manufacturing Innovation Institute, and this is the first Annual Meeting since the Institute’s launch. Synergies between the ARM Institute and ROS-I will be important to monitor moving forward. The morning session concluded when the Windows IoT and Azure teams were represented respectively by Lou Amadio and Ryan Pedersen, presenting their current strategy for ROS support and their plans moving forward, particularly for ROS2. The featured keynote was presented by Dr. Phil Freeman of Boeing, “Why Boeing is Using ROS-Industrial.” Phil offered great insights to the value of ROS-Industrial for Boeing, and what it has enabled for their operations in the context of the challenges Boeing faces. The talk featured example applications and conveyed the message that within the robotics space we truly are at a tipping point with regards to capability and accessibility. A road-mapping session was then conducted, focusing on problems to solve. The idea is to tie problems to projects and then identify the capabilities that need to be developed to meet certain prioritized problems. The problem focus areas were Human Capability, Quality Processes and Execution, Flexibility/Agility, and Strategy/Alignment. Common themes were: standard interfaces, documentation, ROS2 for Industrial applications, ownership and community engagement, simpler recovery means, and real-time diagnostics. ROS-Industrial is a big tent, and is truly global. Each Consortium needs to optimize how it works within their region to meet their member needs and optimally leverage resources available to them. As regional resources are optimized, the other consortia need to monitor developments, share information and ensure that all within the broader ROS-I organization are aware what is in-flight, what development activities are happening where, to reduce/eliminate redundant efforts. ROS2 is here, but there is work to do. It will be important to monitor developments and foster awareness to enable developers, solution providers, and end users to leverage ROS2 capability to complement their end solutions when and where appropriate. There are a number of innovators, solution providers, and end users realizing value proposition on ROS/ROS-Industrial deployments TODAY, and in some cases for some time. Let’s socialize and share their success stories. Foster both membership engagement and community engagement in the vision and execution of the vision for ROS-Industrial. We are excited to both enable start-ups to engage, but also improve how we leverage our University partners. Through effective projects, sponsorships, or roles within the ROS-I organizational structure, these all help foster a sense of community and subsequent ownership. There is an inflection point or tipping point, and for advanced robotics this seems to be an appropriate time. The idea also, that ROS can span beyond just the robotic processes, but do more to enable more intelligent processing via leveraging IoT, enable leverage of advanced technologies for further end user value seems to be gaining steam. We advance ROS-Industrial together. Engage, participate, communicate, and we succeed together. As always, we are looking forward to feedback on the event and how to improve this event and events moving forward. We are looking forward to bringing back the online quarterly membership meetings, so keep an eye on that, as coordination and the invites are hosted on a rotational basis by the three Consortium managers. ROS-Industrial is an open-source project, and with that we seek to be open, and a be that forum for sharing ideas, and solving problems for industry in the 21st century. Public day presentations can be found on the Event Page within the agenda after each speaker line item. Member day presentations are included behind the member portal, and are available for download. Thanks for your support of open-source automation for industry!